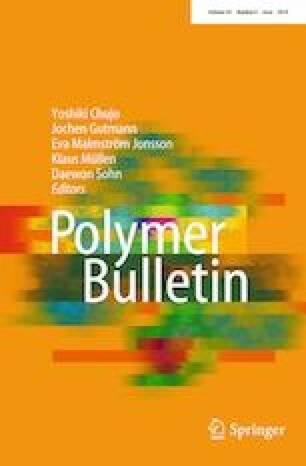 Effects of silicone rubber (SR) on the isothermal crystallization kinetics, non-isothermal crystallization kinetics, crystal structure, spherulitic morphology, rheological properties and mechanical properties of dynamically vulcanized poly(vinylidene fluoride) (PVDF)/SR blends were investigated. Relative to the pure PVDF, incorporation of SR component has not only enhanced the non-isothermal crystallization rates of PVDF in the blends at the same cooling rate, but also increased the isothermal crystallization rates at the same crystallization temperature. The crystalline structure does not change for PVDF/SR blends. The poor interfacial adhesion and poor compatibility between the two phases play a critical role in the reduced Izod impact strength. This work was supported by the Program of Guangzhou Science Technology and Innovation Commission [Grant Number 201607010103] and Program of Guangdong Provincial Department of Science and Technology [Grant Number 2016A010103004].